Glass Sword picks up Mare Barrow’s, a commoner with red blood but with Silver blood ability, the power to control lightning, story moments after Red Queen. She and her friends are on the run from the new king, Maven. 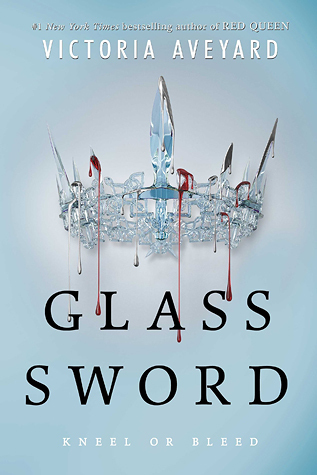 If my synopsis sounds lame, it is because I really struggled with this book and so I am at a lost of the point of Glass Sword. This sequel offers nothing new to the over all story. The prose is bland and the plot contains a lot of meandering between places and constant repetition. Mare’s narrative is tiresome and dull, going over the same thoughts about Cal, Maven and her own specialness. I swear I was going to throw the kindle across the room if she said one more time she couldn’t trust people. Only the last few chapters contain any real action or story development – the rest of the book shows the characters going from place to place in search of those with special abilities who can help their mission. I’m super disappointed that I spent money on this book. I should have just check it out of the library. I will probably read the third book but I’m not going to run out and get it the day it comes out. This entry was posted in Fantasy, Magic, Young Adult and tagged Glass Sword, Red Queen Book 2, Victoria Aveyard, Young Adult. Bookmark the permalink.